Even crazier — no shoes. Have you ever tried that on a treadmill? Blister City! Kiya is a nevernude? Was he at the convention? Yeah I was a lot more disturbed by the lack of shoes. He couldn’t wear socks, at least? Share the foot fungus, everyone! I hope he isn’t one of those people who never washes his jeans. Judging from the dirt around the pockets, your fears may be true. The inside may have more skidmarks than SFO’s east/west landing strip. Looks like someone won a free membership. I think I’ve got him beat. Dan Deacon, Dan Deacon, Battlehooch, No Age in the space of four days: the best way to age denim. No Age rules live! I missed this show but saw them at the new parish a few months back. Needless to say I came home with some aged denim. That’s me in the picture. I’m a regular reader of this blog (good job guys!) so I was excited, if somewhat baffled, to see myself show up on it. Then I read the comments. Some of you guys are mean! I’m mainly at the gym to climb, which I do in climbing shoes. Sometimes I want to get in a little run in after. And for the record, of course I wash my jeans. Ha, I was just clicking through to out this photo as from Mission Cliffs. 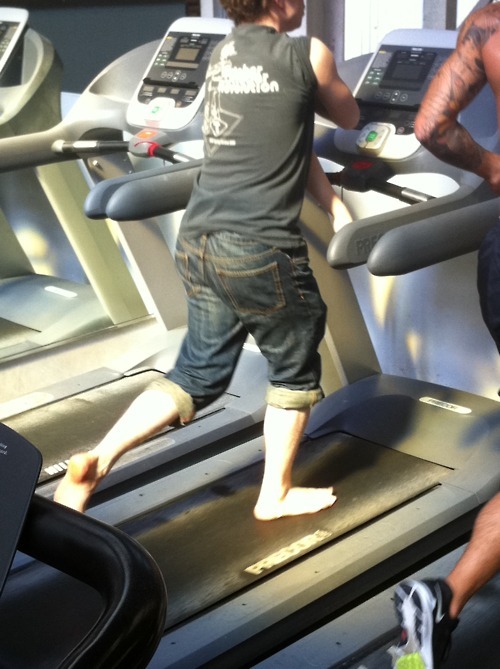 Barefoot-running-in-jeans-before-climbing is standard! But did you get blisters? If I set the machine too fast the track gets hot and that’s trouble, but otherwise it’s not really a problem. I have pretty tough feet though.